Open an image and create a selection of the object you want to recolor. If the object has decent contrast against its background, use either program’s Quick Selection tool (in Elements, make sure you’re in Expert or Full Edit mode to see the tool). In either program’s Options bar, turn on the Auto-Enhance checkbox. Now, drag the tool across the area you want to select: Use a small brush for selecting small areas and a big brush for selecting bigger areas. To remove an area from your selection, Option-drag to put the tool in subtract mode and then brush across that area. When working on metal objects, be sure to select areas where the color is reflected. Click the Refine Edge button in the Options bar of either program to fine-tune your selection. Next, choose Layer > New Adjustment Layer > Hue/Saturation and click OK in the resulting dialog box. In the panel that appears, drag the Hue slider to change color and use the Saturation and Lightness sliders to adjust color intensity and brightness, respectively. The two horizontal bars at bottom are like flattened color wheels. The top bar shows the object’s original color and the bottom bar shows its new color beneath it (circled). If necessary, use the Hue/Saturation adjustment layer’s mask to hide or show the color change in certain spots, say, if your selection wasn’t perfect to start with. Just click the adjustment layer’s mask to ensure it’s active—you’ll be able to tell because it has a light-colored border around it. Next, press B to grab the Brush tool, and then press D to set the color chips at the bottom of your Tools panel to the default of black and white. In the realm of the layer mask, painting inside a mask with black conceals and painting with white reveals. The mask (circled below) is a miniature of your image and by peeking at the mask, you can figure out which color to paint with to either hide or show the color change. And by keeping one finger poised above the X key on your keyboard, you can quickly switch between painting with black to painting with white, or vice-versa. In this example, painting with white inside the mask reveals the color change atop the car’s hood. When working inside a layer mask (circled), remember that painting with black conceals and white reveals. 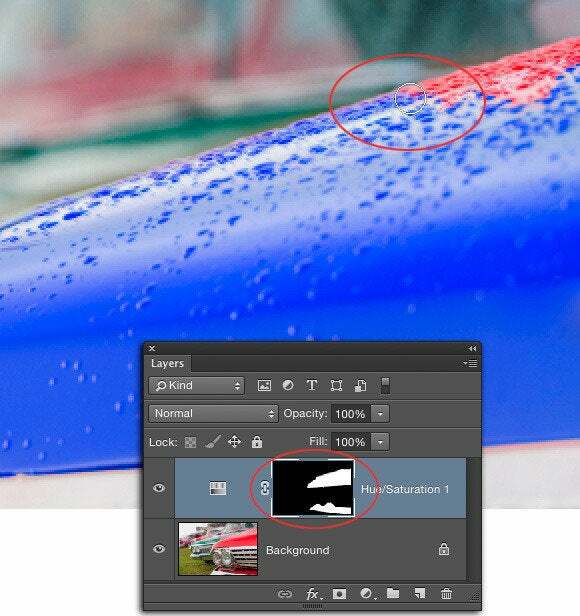 Here a white brush (circled) is used atop the car’s hood to reveal the new color. This technique is works well for changing color without changing how light or dark it is. It’s also great to use if the area you want to repaint has a lot of black, pure white, or gray around it. Why? Because this technique only affects areas that are in color to begin with. So for some images (like this example), your selection doesn’t have to be as precise (yay!). Start by creating a selection as described above and then choose Layer > New Fill Layer > Solid Color. In the resulting dialog box, enter new paint into the name field and change the Mode pop-up menu to Hue, and then click OK. In the Color Picker that opens, use the rainbow bar to pick a range of colors—don’t bother with the large box at left because the blend mode change rendered it useless (that box controls how light or dark the new color is, but it has no effect in this case). Click OK to close the Color Picker when you’re finished. With the Hue blend mode, the new paint affects only areas that previously contained color. If you need to fine-tune the fill layer’s mask (say, to reveal the new paint on the tire), use the Brush tool set to paint with black to conceal the new paint or white to reveal it, as described above. When you’re finished with either technique, choose File > Save As and pick Photoshop from the Format menu to create a master file for editing later while keeping your layers intact. To experiment with a different color later on, double-click either adjustment layer’s thumbnail in the Layers panel to reopen its respective sliders. Of course, there are other ways to change color, too. For example, both programs sport a Replace Color command which you can use to tell the program which color you want to change and what color to change it to, but it’s not very flexible (you can’t experiment with the color change after you finish). Photoshop CC also has a Selective Color adjustment layer, which works in a similar way, though since it’s available as an adjustment layer, you can experiment with different colors and fine-tune the effect using the included layer mask. Photoshop CC’s Hue/Saturation adjustment layer also includes a targeted adjustment tool that’s handy for clicking the color you want to change in the image itself. Nevertheless, the two methods described here should keep you busy for a while.